I am a late bloomer, maybe because i had my menstrual period started at 14. I was in 4th year high school when I have noticed all my girl friends were wearing lipstick, and there…my addiction started! If there is one thing i couldn’t leave home without? AH AH not my phone.. not any accessories, Its a lipstick!!! Please tell me I’m not alone in this lip addiction? 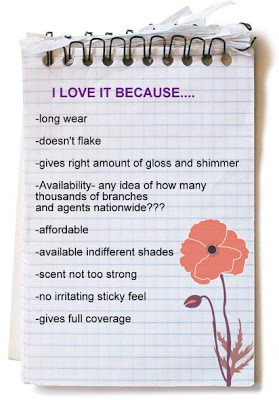 Oh, and any favorite lip products you have? I have a pool of lipsticks I kept even for years now but most are no longer usable but I just love to keep them. My most recent lipstick purchase is a lipstick from AVON. My sister-in-law became an agent of Avon and as her first costumer, I have ordered a lipstick, I always opt for a moisturized lips with a red color that doesn’t sweep off easily. Since most of the day, I am too busy and barely find time to touch up my make-up, I want something that is long-lasting. 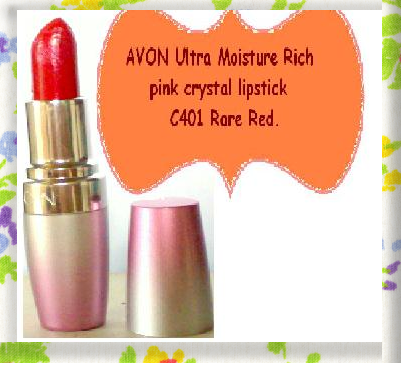 I am happy with what she had recommended, AVON Ultra Moisture Rich pink crystal lipstick C401 Rare Red. I have tried it and really works for me, exactly what I need. It is red not too strong but not lame. iT’S BEST for everyday use, I can feel my lips moisturized but not greasy. I am fair and it looked as just good. I am actually surprised of its moisture effect. 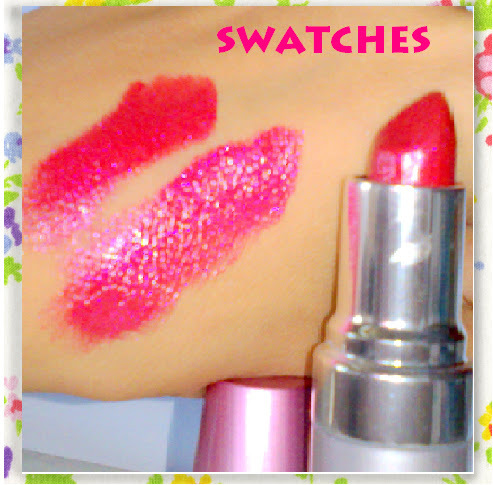 It stands out from other moisturized lipstick that I have tried. The moisture lasts as well, you can see from the picture the gloss and sheer when you apply it. I really love it as it gives the right amount of gloss and moisture that compliment my skin tone and looks. Sometimes too much glossy gives extra effect that makes me look like a chipmunk, lol. I think it is the sheer that covers the color makes the long lasting effect and that makes it perfect for my everyday wear. And good news is, it saves me space on my purse because I no longer need to carry my lip gloss. It has a slight sweet smell which I am not quite sure if it’s cherry or grape smell. I am sorry my sense of smell doesn’t work well lately so it is not reliable enough sissies! 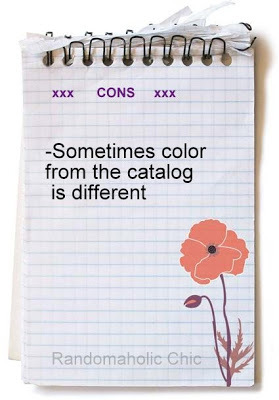 This is an all in one, factor that I really seek in a lip color product. Easy to apply and lasts for 6-8 hours. Final verdict, I describe this as a lipstick that is both a classic and a statement maker. One of my best purchase indeed!!! 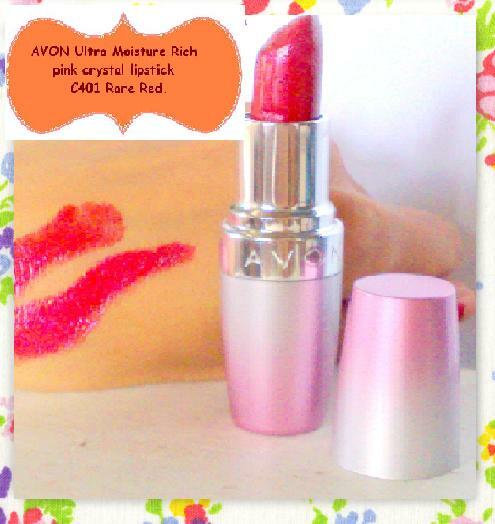 How about you my fellow Chicas, what AVON lipstick you love to wear? 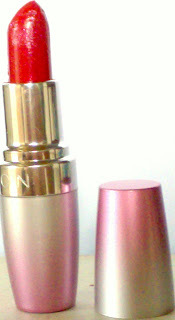 I love avon lipsticks too. This is a bright red right? I'm not sure it it will look good on me though but the packaging is really nice.